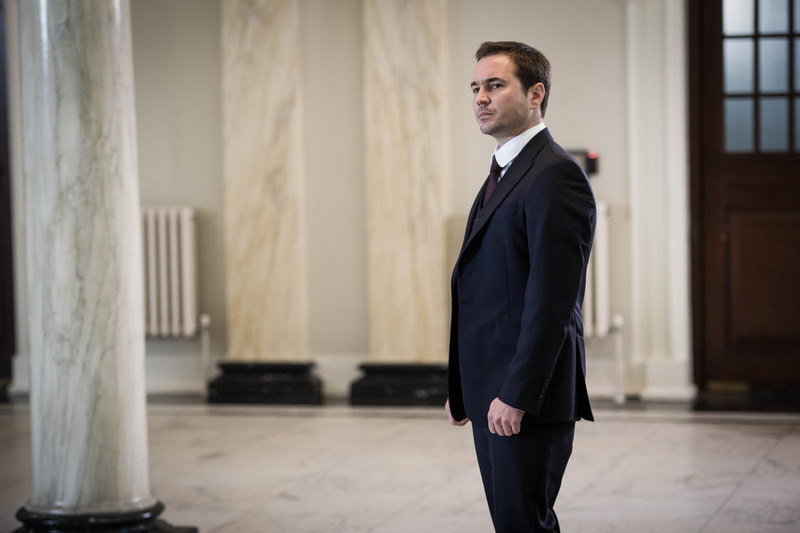 Line Of Duty excels at many things but its prime success lies in confounding your expectations and then confounding what it’s just confounded. Half way through the series and we still aren’t sure who the lead character is yet, nor the motives of virtually anyone who has screen time. Episode three plays out as a three-parter. Firstly, Arnott uncovers Joe, who suffered abuse at Sands view which was a care home where Danny Waldron too was a victim. For the first half an hour it almost feels like we are watching a standard police procedural with Arnott piecing together information of its dark history. It is a fully affecting change of pace. When he tells Joe “Danny’s mission is now my mission and I promise you I will get these bastards”, it comes from the heart but it’s soon followed by his aggravation that the main culprit Dale Roach has recently suffered a stroke and is unable to communicate, therefore will never receive the justice owed to him. This storyline bravely has strong parallels to famous celebrity cases; and is not hiding from this fact. No punches are pulled, not many blanks are left on the page to decipher the similarities. Just like last week, Denton suddenly arrives pretty much on the thirty-minute mark and we are back at the retrial. Lindsay is intimidatingly powerful in the dock until questioned on her honesty with AC-12 when she buckles under the pressure. The jury gives their verdict and she is released with immediate effect on license. Of course she is. It’d be no fun if Denton stayed in prison. Hawes would’ve been too underused , like James Norton was in series two of Happy Valley. Denton is too big a personality to be confined, she need lots of open space in which to reach her ambiguous peak. There’s not much ambiguity about Dot. Maybe he is series three’s big player? Maybe he’s finally the headline act? The strong suspicions we had last week that he’s the crank caller at the end of the line are revealed to be true. Most shows would drag that one out for weeks but Jed Mercurio has so much more lined up that this counts as just one of many stabs into our emotions. In a spectacular showdown the squad chase down Hari only for Cottan to intervene and trap him all for himself. He manipulates like a pro on the spot with each fresh new dilemma he faces, twisting and slithering like the snake in the grass that he is. He plays the hero and is treated like one too. The reception that greets him back in the office is both sickening and hilarious. – “I’ve got a pot on the simmer” – I hope for Dot’s sake his curry is batter than his chat up lines. – Is Kate really flirting with him or is she on to him? She is a very good liar after all. – Arnott could also be twigging to Dot’s wicked ways after his failure to sort the post-mortem and all the increasingly nervous behaviour. – Kate’s tactics have to be questioned this series what with the blatant questioning of suspects and how she watches suspects from a mere 50 yards away with the world’s most massive binoculars. Should have gone to Specsavers. – Tommy Hunter and Lindsay Denton are names that run through Line Of Duty’s history as if it were a stick of rock. – Nooses. There were nooses in series one. Perhaps it’s Cottan’s trademark?